Go Fish for Modern Artists from Birdcage Press is a fun, educational card game. My kids have learned about modern artists and the techniques they use in our weekly art class, and this card game reinforces much of what they've learned from their art teacher. 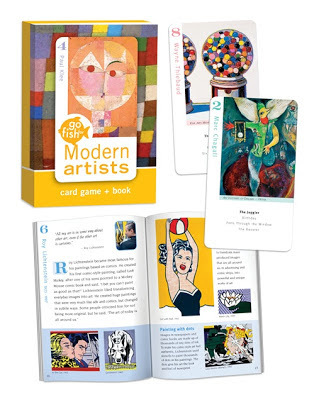 Go Fish for Modern Artists includes deck of playing cards and a fact book featuring artists such as Alexander Calder, Marc Chagall, Paul Klee, and Roy Lichtenstein. The 36 cards feature full-color reproductions of four different works of art by eight different artists, plus four "Modern Art is..." cards. These cards are so pretty, I like to display a different one every few days in our schoolroom to use as either inspiration for making our own art, or as writing prompts. Instructions are included for playing Go Fish for Art, Masterpiece Memory, and Art Pairs. The nicest things about these cards, besides how beautiful they are, is that they can be played with and explored by all ages, and they entice the whole family to play games together. Another perk is the unique packaging which resembles a book so that the cards can be stored easily on a bookshelf (but you will want to leave them out on the coffee table).